I thought this was a strong jacket: simple, elegant and witty. 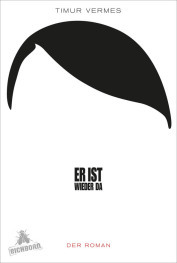 It’s from a novel published by Eichborn (der Verlag mit der Fliege) about Hitler’s return in 2011. Here’s a post showing several classic jackets, and another praising Penguin’s cover design.